This salon prefers an open concept. 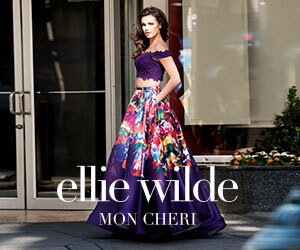 “We have a strong inventory and we like to show it off,” Patrick Kelly says. The J.J. Kelly team (L to R, top): Hoan Pham (seamstress), Patrick Kelly (owner), Que Nguyen (head seamstress). (L to R, bottom): Jane Kelly (owner) and Dorothy Kelly (owner). Debutants in November and December, as well as alterations, keep cash flow coming in year-round. There aren’t many people who can say they got to experience what it was like to be a bride well before actually becoming a bride. But in 1958, that’s exactly what happened to Dorothy Tramontana, when she was chosen to reign as a young queen bride for one of New Orleans’ famous costume balls. Looking at a number of photos that captured the event, anyone could mistake that evening for a real wedding, complete with all the details. Dorothy’s sheath silhouette of Chantilly lace, featuring long, pointed sleeves, a Sabrina neckline, and a royal cathedral train complemented her beauty perfectly and spoke to her innate sense of style. Escorted by the handsome John Kelly, who would become her real husband four years later, the two enjoyed an unforgettable evening, playing bride and groom. “Dressed as a bride, little did I know of the things to come,” Tramontana says. In 1975, the now-married couple moved to Stillwater, Okla., and opened up a jewelry shop with a junior clothing line. But in noticing the area had no bridal salon, they spotted an opportunity to meet that local need. Encouraged by their clothing-industry contacts, they decided to give bridal a try, adding an official department in with their current mix. So off to Dallas Market the Kellys went, officially entering into the bridal business in 1979. They quickly realized the demand was, in fact, very real. It was a great strategic move, yet the Kellys learned that managing the two stores 60 miles apart wasn’t easy. They had four children, including a son, Patrick, and a daughter, Jane, who increasingly would become directly involved with the businesses over the years; today, they still serve in a vital leadership capacity. So after approximately four years of running both stores, John and Dorothy decided to close the Stillwater shop altogether and consolidate everything to focus on J.J. Kelly Bridal Salon, their new flagship store in Oklahoma City. To their surprise, however, the market for this bridal business kept growing, so when the chance came up for them to move into a larger space in the same commercial building, the Kellys jumped. That final, big move to the more spacious store was in 1995, and this is the locale that remains open and thrives today. Yet of note: it’s not been the sole source of bridal attire provided by this family since that major decision and last relocation. As well, Jane had had an epiphany, realizing that it would be a smart business move to transform this family affair into one that offered more high-end couture price points, Dorothy says. It took some years to do this, but the goal then and now is to cater to the luxury bride both in the store’s backyard and beyond, attracting customers from throughout Oklahoma and across the state lines, including Dallas, about a four-hour drive away. As Jane tells it, her mother was always (and still is!) someone who dressed impeccably and had a high appreciation for finely made, high-quality beautiful clothes. Everything about the store needed to reflect that appreciation and her values in order to draw likeminded customers. With its elegant ambiance and décor, the look and feel of the shop already spoke to this niche clientele – everything from the Wedgewood blue carpeting and moire-taffeta-covered walls to the 20-foot ceilings and equally tall three-way mirrors set the stage for utter glamour, making for a backdrop against which the high-end gowns really pop, Jane says. So no question about it, this clarification around the brand, evolving J.J. Kelly Bridal into a more upscale locale featuring high-end gowns while the outlet store addressed the moderate bride, was, in big part, in response to the economy and the advent of David’s Bridal. And yet, its owners never want to turn away an opportunity for helping all brides make their dreams come true so they purposefully carry a small offering of moderately priced gowns. It’s a strategy that they’ve come to know is important, too, particularly in a state that’s greatly impacted by one of the country’s biggest economic drivers. 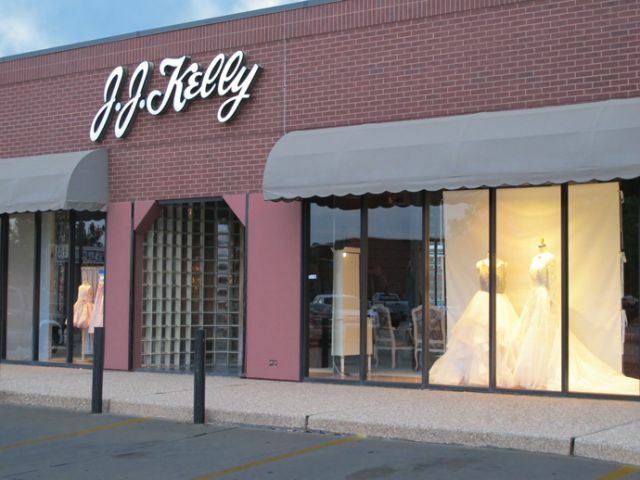 With about 10 percent of J.J. Kelly Bridal’s inventory and samples dedicated to the more modest price point, brides of more modest budgets can feel comfortable knowing they can have a bridal shopping experience here. 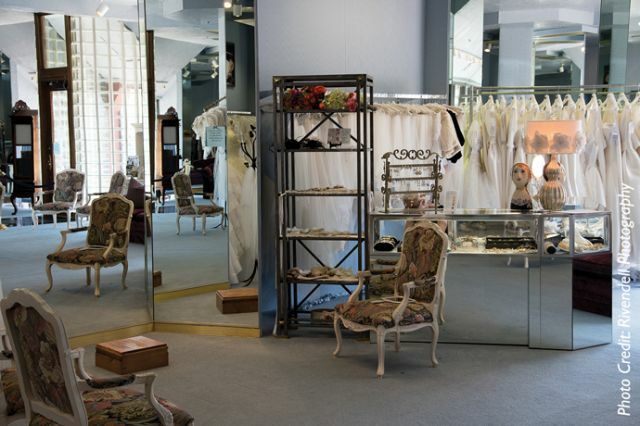 And the owners of J.J. Kelly Bridal benefit, too, knowing they don’t have to turn anyone away. The key has been to learn from lessons over the years, remain proactive, and take corrective actions as well, keeping a close eye on inventory and not over-spending. And that’s where John has factored in on more than one occasion. Patrick says his father – who has been his mentor in running all the office and behind-the-scenes aspects of the business – has been the voice of reason, often playing skeptic in key decision-making times. “Whenever we’ve gone to market and there’s been the temptation to overbuy, then there’s Dad to think about,” says Patrick, noting how John maintains the balance between spending and splurging for the business. 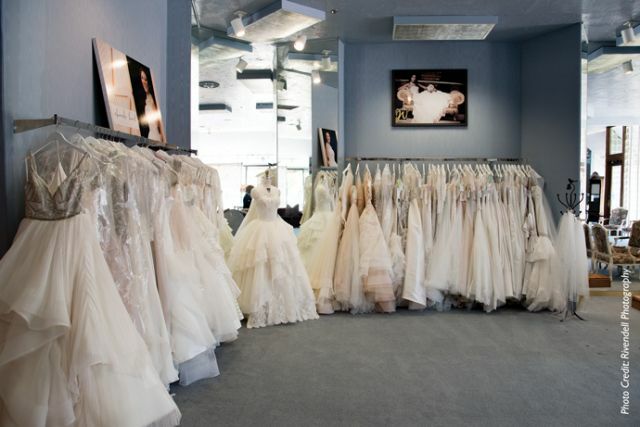 Even today, J.J. Kelly Bridal weeds overgrown inventory by consigning out slow sellers and other styles that can free up space for incoming and stronger gowns. And when economic times get testier, the business owners may opt to hold off on hiring additional staff, sticking with just their family members and in-house alternations staff to ensure a sound bottom line. It’s a bit more work for everyone and they spend more time together, but that’s OK. Fortunately, they love working alongside one another – a factor that’s supported the legacy of the store and multiple decades of its success. The prayers may just have helped over the years because in spite of economic factors, threats like David’s Bridal, and other external changes, J.J. Kelly Bridal is still doing well. But the store’s success is no doubt in part to the creativity and hard work of this family. 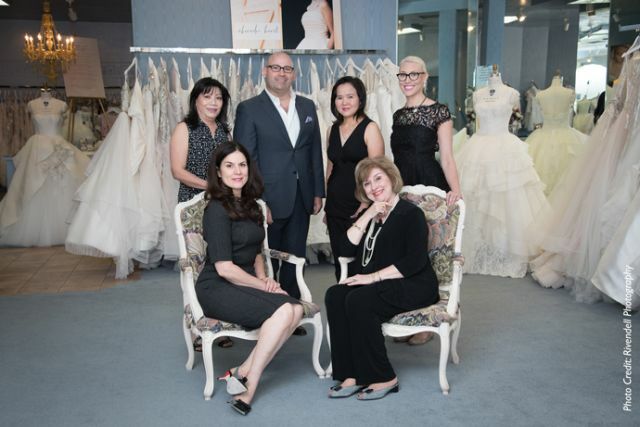 For example, while maintaining a strong hold on the luxury market and meeting the needs of a smaller market of brides with more conservative budgets, J.J. Kelly Bridal has spent the past few years reinforcing its commitment to stellar service through a number of innovative strategies that really speak to modern brides. 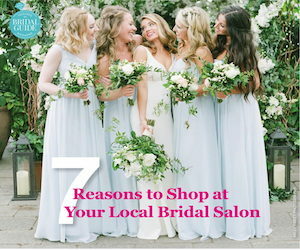 For starters, the business has identified that today’s bride wants a seamless, hassle-free experience that starts the moment she inquires about the salon’s services and begins booking her appointments. Responding to that, Jane came up with the idea – and then Patrick worked with software developers – to create a unique technology called “IDoAppointments.com®” through which brides can book not just appointments at the store but other preferred wedding professionals, as well. The beauty of the software isn’t just that appointments are booked but it syncs with customers’ calendars and other preferred technologies, too. Customers get multiple reminders of their appointments via text messages and e-mails, plus contact information (of course, highlighted in their signature color “blue”) that enables greater access to Patrick should there be any questions about the appointments or upcoming experience overall. The service is free and easy for brides to use. In addition to this interactive appointment-booking service, the Kellys have developed other ways to wow their brides. For example, they’ve changed up how they approach trunk shows, building in a luxurious breakfast event, working with preferred wedding professionals (florist, photographer, caterer, etc.) and going all out to truly make trunk shows a special experience – an event that takes place on Saturday mornings before the store opens for regular business. From this most recent experience, Jane has really noticed the power of bloggers, and other social-media influencers over business today, particularly in terms of providing valuable information to current and potential brides and sharing important news about J.J. Kelly Bridal. In response, she is changing up her marketing approach to include this growing trend and will, of course, be keeping her local favorites, The Double Take Twins, in mind. In addition, recognizing that for some of today’s brides, luxury means having a more intimate, highly personalized shopping experience when choosing a gown, J.J. Kelly Bridal now offers private appointments twice a week. 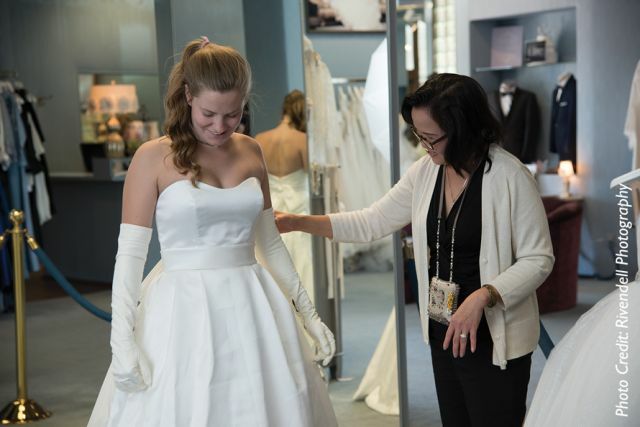 During these “Blue Carpet Appointments,” which run about three hours, J.J. Kelly Bridal closes to all other customers and puts its full attention on this appointment only. For just under $300, the customer may invite up to 10 of her friends and then enjoy champagne/mimosas + treats in-house, a complimentary gift bag full of goodies from the store’s preferred wedding professionals, a table spread featuring her wedding’s color palette, and the add-on option for limousine transportation. Brides who commit to a gown during that appointment are rewarded with a $100 voucher toward the gown. But Blue Carpet Appointments aside. . . regardless of whether a bride books privately or during regular store hours…at this Oklahoma City store, all brides who say “yes” to the dress receive a champagne toast in J.J. Kelly Bridal style. “We pop the cork and do a celebration,” Jane says. But that’s not all: In spite of the fact that her dress must be special ordered, no bride leaves empty handed – as if something major is missing or left behind after all that personalized attention, pomp and glamour. When they walk out the door, they take with them a keepsake, reminding them of their friends at J.J. Kelly Bridal and all that is soon to come. “It’s our way of giving them a piece of our love,” Jane adds quickly. The little memento speaks volumes. Wearing it out and about, showing it to friends and family or simply touching it about the nape of the neck, knowing it’s there, these brides know they’ve become a true “J.J. Kelly Bride.” And this in and of itself becomes its own luxury.